NativeEnergy helped Stonyfield Farm install a solar array on their New Hampshire manufacturing facilities. Location: Londonderry, New Hampshire, U.S.A. 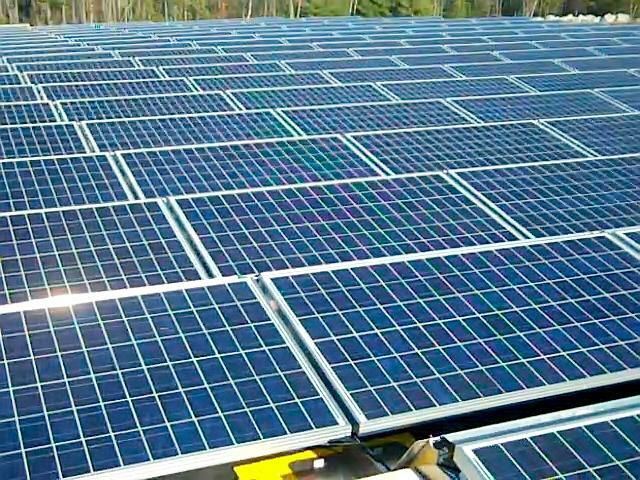 In the summer of 2005, we helped build what was New Hampshire’s largest solar array, a 50 kW system on the roof of our long-time partner Stonyfield Farm’s manufacturing facilities. The system was developed and is owned and operated by Vermont-based Solar Works. It was financed primarily by Stonyfield Farm’s purchase of the expected life-of-project REC output, and without state funding as is available for solar power installations in many Northeast states. Stonyfield Farm’s visitor center is equipped with a real-time power monitoring computer and information describing how the system generates clean energy and fights global warming. “This project is another step for us on our journey toward our dream of freeing Stonyfield Farm from the impacts and risks of fossil fuels,” said Gary Hirshberg, Stonyfield Farm President and CE-Yo. Unfortunately, this project was damaged by a wind storm and has not yet been replaced. As Stonyfield Farm was the sole purchaser from this project, we are following their lead in securing a replacement. This project is a collaborative effort between Stonyfield Farm, NativeEnergy, and Solar Works. This project’s emissions reductions were quantified using the Climate Neutral Network methodologies. This project met NativeEnergy’s stringent additionality criteria, as our funding was necessary to the project’s implementation.